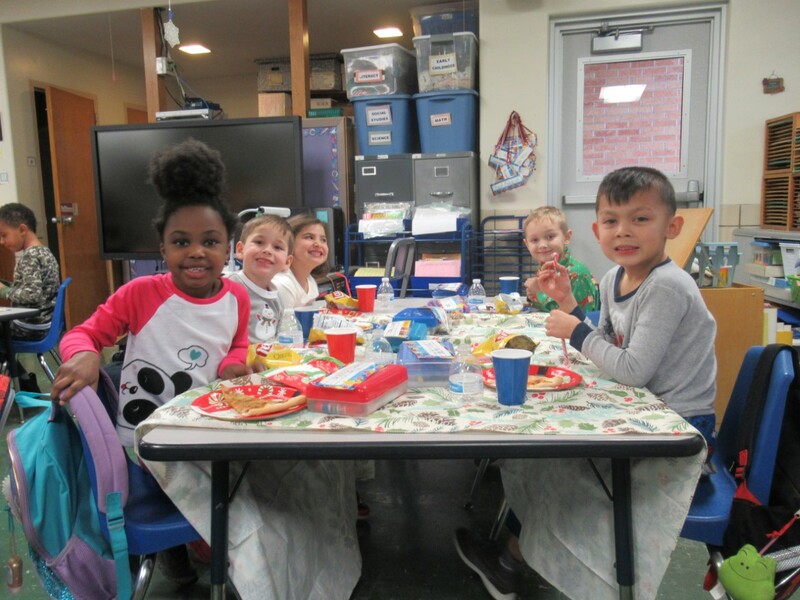 Neighbors | Jessica Harker.Classrooms at Robinwood Elementary School in Boardman celebrated the begining of break with a holiday party organized by PTA members. Neighbors | Jessica Harker.First grade teacher Mrs. Rowe played a game with her class Dec. 21 during the school's annual holiday party. Neighbors | Jessica Harker.First grade students played a game revolving around Christmas traditions around the world Dec. 21 during Robinwood Lane Elementary schools annual holiday party. Neighbors | Jessica Harker.Kindergarten students at Boardman Robinwood Lane elementary celebrated the holiday season with a party, including pizza and candy canes provided by the school's PTA. Neighbors | Jessica Harker.Kindergartners celebrated the last day of school with a holiday party at Robinwood Lane Elementary school Dec. 21. Boardman Robinwood Lane Elementary School celebrated the upcoming break with a holiday party on Dec. 21. Principal Don Robinson said that the party is a school tradition. “It’s been tradition as long as I have been principal and I have been here 48 years,” Robinson said. Robinwood PTA members organized the event, providing snacks and games for each classroom in the school. Students enjoyed pizza and candy canes while they played games in the fifteen different classrooms. “Our PTA does a good job of organizing them along with the teachers and home room mom and dads,” Robinson said. He explained that along with Christmas, the school holds holiday parties for Halloween and Valentines Day each year. Robinson said the parties have changed throughout the years, being less focused on holiday food and more about playing games. After the holiday parties students gathered together to end the day with a sing along party. “We get together as a whole school and get that feeling of the holidays, its a nice way to end the day.” Robinson said.